1967 is the year famous for the summer of love, flower power and enlightenment. Procol Harem’s ‘A Whiter Shade Of Pale’, ‘All You Need Is Love’ by The Beatles and Scott McKenzie’s hippie anthem ‘San Francisco (be sure to wear some flowers in your hair)’ wafted continuously from trendy clothing boutiques, cafe’s and bed sitting rooms everywhere. To top it all, “Sgt Pepper’s Lonely Hearts Club Band” album released in June of that very year meant popular music could never be the same again! Our story however, begins on Sunday 22 August, 1965 at The Adelphi Ballroom in West Bromwich which saw Brierley Hill group “Dean King and The Conquests” as winners of “The Scene ’65” competition where twelve groups had battled it out for the title. The group line-up was Brian “Fred” Griffiths (aka Dean King on lead vocals), Terry Wildman (drums), Philip Terrana (bass and vocals), Anna Terrana (vocals) and Anna and Philip’s cousin Kevin Bray (guitar). Ironically, Anna was a reluctant singer. After Philip had entered the group for The Adelphi competition he soon realised that all of the other contestants followed the then-familiar line-up of three guitars, drums and a male lead singer. He felt his group needed a ‘gimmick’ and so turned to Anna to oblige. Philip continued unsuccessfully, or so it seemed, to persuade Anna to realise his plan until finally, and at almost the last minute, she capitulated and with Sonny and Cher’s latest hit ‘I Got You Babe’ and Marianne Faithfull’s ‘Little Bird’ she swept Dean King and The Conquests to victory amidst rapturous applause from The Adelphi audience. The “Express and Star” and the then “Birmingham Planet” local newspapers, both reported the group’s victory the following week and Anna became an instant local personality in Brierley Hill and at her place of work – John James Electrical where she was employed as a records clerk. Philip’s plan had paid off. 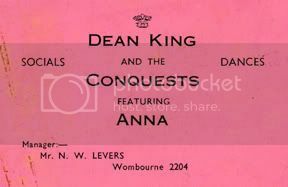 For the next six months the group was billed as “Dean King and The Conquests (featuring Anna)”. She would take to the stage at the end of the last set at 10.30 pm, do her two numbers and close the show ten minutes later. Eventually her appetite for singing would grow and so would her repertoire to match it. Seventeen year old Anna may well have been a reluctant singer but she had no problem as a child appearing in school plays and shows. Anna and brother Philip came from an Italian musical family so, music was in her blood whether she liked it or not! Their parents Josephine and Salvatore, met at the Italian prisoner of war camp in Bromley Lane, Kingswinford (opposite where Crestwood School now stands and sited where the High Acres housing estate now stands). Josephine played accordian and was one of the group of entertainers who performed at the camp where she met fellow Italian, Salvatore Terrana. They fell in love (even though fraternising with the ‘enemy’ was frowned upon by the locals) and finally married upon Salvatore’s release at the end of the war and moved to Hickman Road in Brockmoor, Brierley Hill where they were to raise their family. It was normal in the sixties for groups to continually re-invent themselves with a new name and image and so “Dean King and The Conquests” became “Our Generation”. The foundation for the forthcoming and hugely popular “Lady Jane and The Royaltee” was now well and truly set. The line-up of “Our Generation” was the same as “Dean King and The Conquests” except for Terry Wildman who was replaced by Roger Constable, himself being later replaced by Stevie Woodhall. In fact it was to be Anna and Philip who remained as the nucleus of all future incarnations of the group and their unique sound. 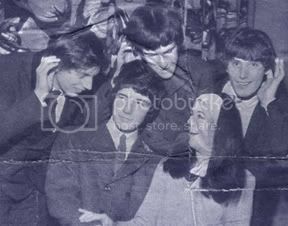 Whilst playing at Wolverhampton’s “Ship and Rainbow” in Dudley Road, Wolverhampton, Our Generation was spotted and immediately signed up by local agent and manager Maurice Jones from Astra Agency and in Anna’s words; “We hardly ever had a night off”… and Maurice was to prove a great influence in the groups’ development” says Anna. Astra was the main agency in Wolverhampton and established in 1963 by Len Rowe. Apart from Maurice Jones the agency also comprised of Alan Clayton, Stan and Pete Fielding, George Maddocks and Tony Perry. Both George and Tony knew the business from both sides as they were once drummer and saxophonist respectively, with popular Wolverhampton group The Strollers during the late fifties/early sixties. Astra had twenty six local groups on its books including Lady Jane and The Royaltee and each one working an average of twenty eight gigs a month. The Express and Star had its famous full-page Entertainments guide on page 2 every day and an example from 03 August, 1967 offers a billing of 19 groups spread over 14 local venues. Each group had its own quota of supporters but even though the competition was stiff, the camaraderie between all of the groups was outstanding. Following a management makeover from Maurice “Our Generation” morphed into “Lady Jane and The Royaltee” comprising Anna Terrana (lead and harmony vocals), Philip Terrana (bass and lead/harmony vocals), Geoff Hill, lead guitar (replacing cousin Kevin Bray), and Graham Nock on drums (replacing Stevie Woodhall). This would be the ‘classic’ line-up that would go on to record two singles on the CBS label in 1969. Turning full-time professional becoming a necessity rather than an option. 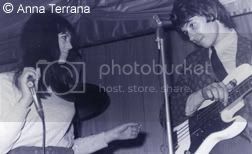 A fifth member of Royaltee is seen on some photographs and Anna explains; “His name was John Beatty – a lead guitarist with “Spectrum” who guested with us from time to time and although he appeared on a couple of photos he was not a regular member of the group”. Even with her performing experience, Anna at that time was nevertheless quite ‘statuesque’ on stage, singing with little or no movement. Maurice suggested she use a tambourine to at least inject some “life and movement” into her presentation. This worked! She used the tambourine against her left hand and also her right leg – which resulted in bruising, such was the vigour of its use. Anna now had the complete visual image to match her vocal prowess. Being of Italian descent, Anna and Philip were naturally very fashion conscious. Anna’s flair for style attracted local boutique owners to gigs just to see what she was wearing in order to meet demands from female punters. It was Philip who “dressed” the lads in the group though. Fashion was caught up in in the phenomenal growth of youth culture, and men too began to discover their peacock side – growing their hair long, wearing flowery shirts and beads or donning kaftans. Anna, being the only daughter and of Italian parents saw her father, Salvatore performing the duties of ‘roadie’. Of course, the real motive was in true Italian tradition, to act as chaperone to his daughter who, incidentally, had to be home by 10:00 pm if she went out on a rare night-off from gigging. Apart from the regular gigs in and around the Midlands, the group also did the obligatory Northern cabaret clubs appearing alongside such household names as, The Searchers, Long John Baldry, Walker Brothers, Marmalade, Mud, and The Tremelos to name but a few. They also played some gigs in Belfast at the outbreak of the civil unrest. “There were sand bags against the doors and windows of the venues we played to guard against bomb blasts” said Anna. “We were all scared and glad to be back home after the tour”. If we were to put a style to Lady Jane and The Royaltee it would have to be that they were very much “Mamas and The Papas” with similar sound and harmonies. In fact, Express and Star music journalist John Ogden wrote in one of his review columns; “She (Anna) looks great and sings better than most. Her style is the nearest I have heard to that of Mama Cass of the Mamas and Papas”… One of her showcase numbers, which was often a show stopper was Mario Lanza’s Coma Prima which, of course, she sang with great gusto! Although Anna was intentionally centre-stage, Philip was an outstanding musician and singer able to stand shoulder to shoulder with the best in the business. In fact it was, in essence, a team effort as the whole group were polished professional performers. The group had, during 1969, cut two singles for CBS ‘That Kind Of Girl” composed by John Phillips (of The Mamas and The Papas) the B side of which was ‘Will You Be Staying After Monday?’. The follow-up single was ‘Let’s Ride’ coupled with ‘I Need Your Love’. Philip sang lead vocal on both A sides and Anna sang lead on both B sides. Anna says; “We arrived at the recording studio and had twenty minutes on our own to run through the lyrics of each song and then gathering around the piano for a half hour ‘rehearsal’ before laying the songs down on tape. It was all done ‘live’ in the studio in just a couple of takes. Recording was a most memorable experience”. The B side of the follow-up single was highly rated by Radio One DJ Tony Blackburn who felt it should have been the A side. Both discs were produced by Irving Martin who favoured big productions so all four cuts were subject to the obiquitous 23 piece orchestra backing tracks as were most other groups of that era. This was designed to deepen the texture of pop records since there was only so much one could do soundwise with just a couple of guitars, a bass and drum kit. Whatever Blackburn’s incessant inane daily ramblings on Radio One he did (for once) have a point. Philip nevertheless delivered a very polished performance to what is a very worthy A side. Without question, this was a double A side single. Phil sent a copy of Let’s Ride to Princess Anne to which he received a grateful thank you letter from her lady in waiting dated 16th July, 1969. 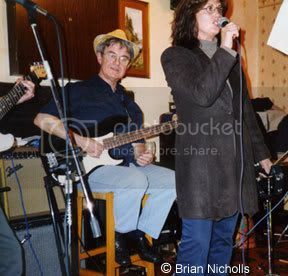 Whilst playing at the famous “2 I’s” coffee bar in London (where Cliff Richard was discovered), Philip Terrana was approached by record producer Tony McCauley who invited him to join a band he was putting together called Edison Lighthouse and there was to be a record deal and an appearance on Top Of The Pops. However, literally two minutes before the programme transmission, the spot was pulled because of “contractual issues” with the group members. This had a devastating affect on Philip who was so disillusioned by this he felt he was no longer able to continue with the music business. They all returned home and “Went into a bit of a lull” according to Anna. They picked themselves up by approaching Jon Fox – bass guitarist and vocalist with Varsity Rag but in the event, Jon (who himself, later went on to join Cathedral and Jigsaw) declined the offer. “Lady Jane and The Royaltee” became “The Royaltee (featuring Lady Jane)” and then, just plain “Royalty” (note the change of spelling) because it was felt that the new shorter name was more DJ and radio friendly. Tom Jones’ manager Larry Page asked Anna to meet him at his Park Lane office after hearing their single on the radio and suggested that she leave Royalty for a solo career managed by himself. He even ‘guaranteed’ her a number one hit! She declined the offer, instead preferring to remain with her group. In the event, Larry Page offered the song ‘And Suddenly’ to Samantha Jones who took it to number one. Philip eventually left and went on to open a male clothing boutique called “Renaz Man” at 262, Castle Street, Dudley with his wife Rena and then a second one at 61 Victoria Street, Wolverhampton called “The Village”. As a result of Philip’s eventual departure “Royalty” disbanded and manager Maurice Jones introduced Anna to Jason Cord’s former backing group “The First Chapter”. “We all hit it off when they called round at my house” says Anna so, they instantly became the new “Royalty” comprising of Paul Robbins (organ/guitar/vocals), founder member Keith Tully (drums), Mac Bailey – ex Tommy Burton Group (guitar), and Pete Bickley (bass) who had played in Steve Brett’s Mavericks along with Noddy Holder. This continued for a short while but then, at the behest of their record producer Larry Page, they underwent yet another name change, this time to “Fable”. This incarnation made its official debut as an entity in 1970 and went on to make two singles and an album for The Penny Farthing label whilst performing a five month stint in Munich in the meantime. Brian Nicholls plays bass with Anna Terrana still rocking! The now twenty five years old Anna quit the music business altogether in 1973 for health reasons but has, over the ensuing years, remained a local celebrity having been the subject of numerous press articles. As a result, people still recognise her and stop and talk to her to this day such was her charismatic persona on the local music scene. The live music scene had all but come to an end at the close of the decade with venues dramatically disappearing and with the emergence of a new, less musically-discerning generation of disco obsessed punters. Anyway, many of the pioneers had settled down and got “proper jobs” just like their parents’ had always suggested they should! Anna was a role model in her day for all young women in what was a male dominated business as far as the group scene was concerned. There will never be times quite like the sixties again with contributions from countless musicians and singers such as the like of Anna and her group all of whom put in countless hours of rehearsal and preparation time as well as investing a small fortune in equipment. Whether you “made it” or not was a lottery even then. What mattered was that it was an activity that could be enjoyed by all. Anyone with an ‘appetite’ to perform could do so. The sixties was an iconic period and the music of the time was the soundtrack to the youth culture. It was the province of the young in years who went on to become the young at heart. Musical talent certainly must run in Anna’s family as her son Dominic (see photo) has followed his uncle Phil as a bass player. The Beat goes on! Lady Jane and The Royaltee. Would it be possible to pass my details on to Brian, I’d dearly like to catch up with him and for him to see the latest material I’ve been working on solo wise and also with my band. I got to know Anna quite well. Fantastic lady, I loved the music and the fascinating story of the band, With Anna`s permission I have revamped and coloured some of the bands photo`s. I remembered Lady Jayne and the Royal Tee at the Bolero Club in Wednesbury. I did a bit of singing myself and always appreciated applause. All too often people just carry on drinking and talking and to not acknowledge the performers. Consequently I always clapped after Anna had completed a number and she smiled appreciatively. My girl friend at the time grew more and more jealous and accused me of fancying Anna (which I certainly did). Eventually she walked out in a rage and I never went out with her again.